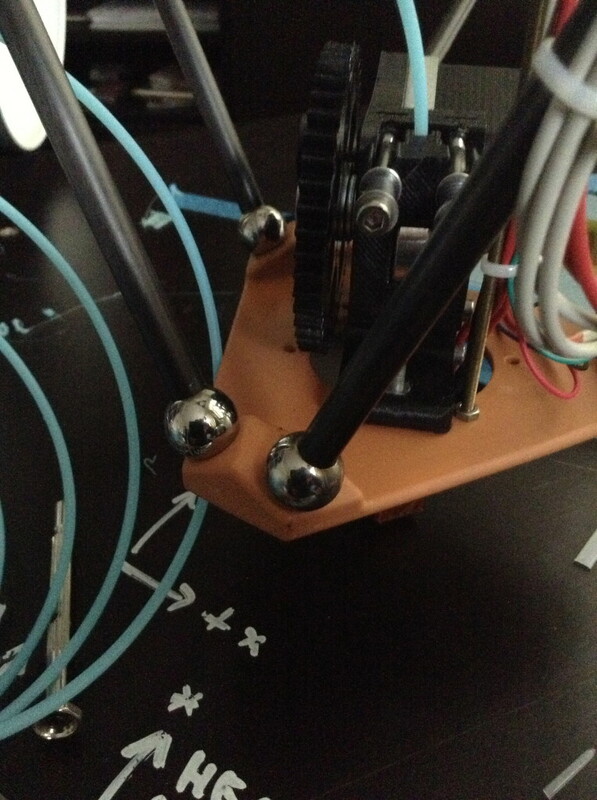 We are proud to show some photo's of our working solution for making very simple ball joints for our printer. A few months ago Kees came up with the idea of using magnets to pull ball joints in a ball seat. We have done some dry runs before but did not print because of the lack of an extruder. Because of us both being busy with our work we did not make as fast progress as we would have liked. The big plus about this joint is the very limited number of parts that are used for this. You need a base (carriage or effector plate) for the seat, a steel ball (ball from a bearing for example),a strong rare earth magnet and a carbon fibre rod. Furthermore there is no play because of the magnet pulling the ball in the seat, always in the same direction. Another advantage is the big angle that can be reached. The rods were made by drilling a hole in the balls (no accuracy needed for this) and gluing 2 balls on the ends of the carbon fibre rod. The important thing is that all the balls on the rods have the have the same center dimension. By making a simple rig for fixing the balls while the glue sets this is relatively easily done. The effector plate and the carriages that were made for this printer are made with an SLS machine because we did not have a printer ourselves at the time. I'm positive though that this can be made with the normal FDM printing techniques. That's the next goal for us... Making another effector plate and carriages because one printer is not enough for 2 people. 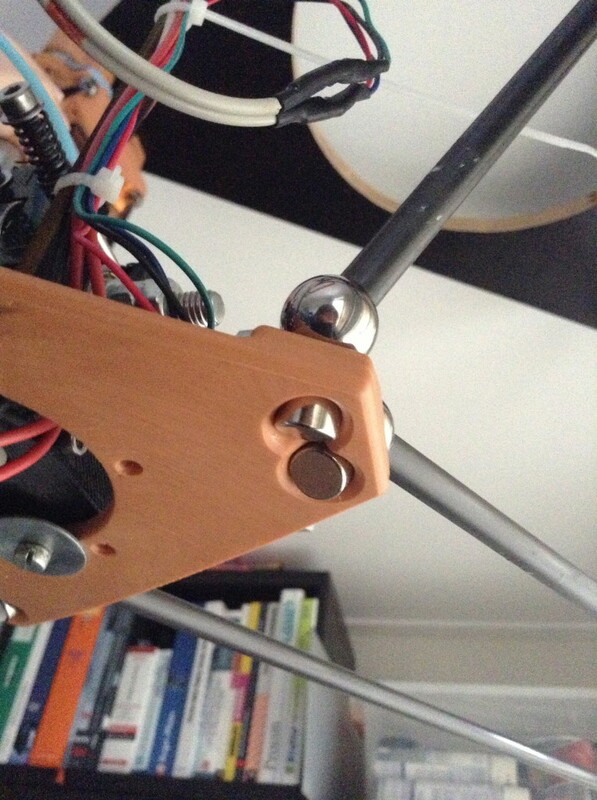 This entry was posted in 3D printer and tagged 3D printer, ball joint, magnet, print, reprap by Bas de Bruijn. Bookmark the permalink. Any chance you could share the Solidworks files for your effector or carriages? I would greatly appreciate it! Hi George, sorry, I can't do that because of some agreements I have. But have a go at the ball joints and magnets. It's not too difficult to model.